On the 12th March, 2013 the world community celebrates the 150th anniversary of the birth of Vladimir Ivanovich Vernadsky, the prominent scientist and philosopher. UNESCO put this date on the list of significant jubilee events. The significance of V.I. Vernadsky personality is hard to overestimate. Vernadsky was a natural scientist, a philosopher and a public figure, an establisher of science, a founder of various modern sciences about the Earth such as geochemistry, biogeochemistry, hydrogeology, radio-geology, and genetic mineralogy. He also was a Founder and the first President of the Ukrainian Academy of Sciences, a Founder and Director of the Radium Institute and Biogeochemistry Laboratory in St. Petersburg (now – The Institute of Geochemistry and Analytical Chemistry named after V.I. Vernadsky in the Russian Academy of Sciences), a member of the USSR Academy of Sciences, a member of Czechoslovak and Paris Academies of Sciences. Each article about Vernadsky begins with the same or similar list of the scientist’s achievements and academic ranks. He was truly an outstanding mind of modern times, a “godfather” of many scientists of our days, a founder of a range of new research institutes, museums and scientific schools. However, these are not the only and not the most impressive scientific achievements which make V.I. Vernadsky personality so relevant and significant for our organization. True greatness of Vernadsky, irrefutable genius of the scientist is manifested in his unique philanthropy, his fascination to the planet’s destiny and infinite devotion to his ideas. 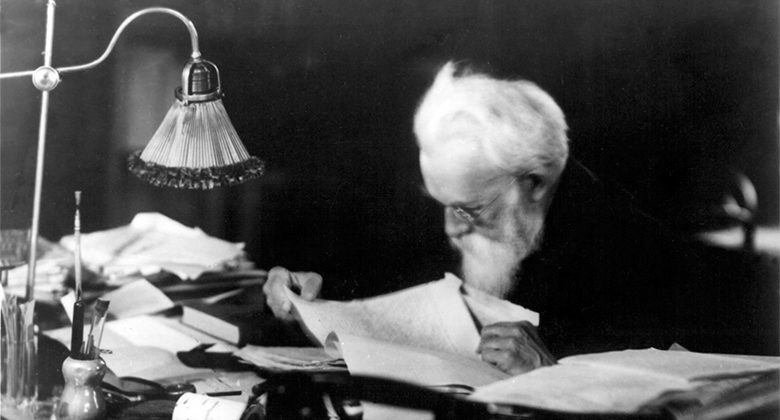 Nowadays, when we more and more often hear about crisis phenomena in science and society, the necessity of personalities like Vernadsky as well as to bring up a new generations on his studies, which are based on the simple postulate “think and act in a planetary aspect” becomes a vital one. Now it is obvious that no organization can target their activity only on profit making. We inevitably participate in social processes one way or another and depend on the system existing in our society. And, we therefore depend on the society and are responsible for its development. Interaction algorithm is very simple here: an organization gets involved in global interaction, it activates some social processes aimed at creation of new knowledge society where favourable conditions are established for everything and everybody: a person, a country, a world and a planet is created. That is why we develop Vernadsky’s noosphere concept, actualize the words of the great scientist, initiate scientific processes, open our own Scientific School and organize scientific conferences. I am sure that for the organization’s members this year will go under the sign of V.I. Vernadsky’ s idea development. I also consider it as a good start that our International Academic and Research Conference “Strategic Solutions of Information Development of Economy, Society and Business in modern times” includes a workshop dedicated to Vernadsky’s ideas and their application within the Noosphere. Scientific discussions of the conference will touch on issues of space, economy, computerization and definitely the noosphere concept and its influence on the organization’s development. Popularization and elaboration of V.I. Vernadsky’s ideas, his concept of noosphere are the steps, which meet the real challenges of the time, it’s a personal task for every Noosphere’s member and a task which serves to achieve our common goal – to create knowledge society of equal opportunities.